This is a blog viewing the world, politics, social interactions, spiritual quests, and the pathless Way from a Buddhist-Progressive-Psychological perspective. ZEN MASTER LINJI'S WARNING: "Followers of the Way, do not seek for anything in written words. You will tire your heart and inhale icy air without profit." George Carlin's Warning: "The owners of this country know the truth: its called the American Dream because you have to be asleep to believe it." 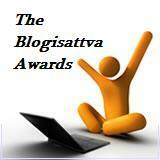 Click on the picture to nominate Turning the Wheel of Wonder for a Blogisattva award. Andy Ferguson leads China tours and special tours of Chan (Zen) Temples. PORTSIDE - Collection of writings "from the left side of the Internet" . I found Christopher Hammacher’s article titled, “’Zen Has No Morals!’ - The Latent Potential for Corruption and Abuse in Zen Buddhism, as Exemplified by Two Recent Cases,” to be interesting and drawing in my attention, as well as being both provocative and evocative. And it also has severe limitations and shortcomings. A personal note as a caveat lector: about 30 years ago to test myself in public speaking, I entered an “open mic” warm-up competition for amateurs at a local pub that was hosting a tour of a comedy competition for semi-pros. I wrote my own script and as part of my act I introduced myself as a Zen Buddhist. I said something like, “You know Zen, right? People sit around and call that cultivating the truth. Yes, it’s a cult, sure, but it's the cult that is able to laugh at itself.” Not too many people got it, but one of the touring comedians came up to me afterwards with kind words saying while my routine was over the heads of most of the alcohol swilling audience, he got it and thought is was intellectually funny. I hope the reader can get it too. While I think Hammacher is erroneously calling Zen a cult, I’m not righteous about my disagreement. As I see it, fundamentally any organization of three or more people who are cultivating something together as a joint project is, generically speaking, a cult, and as such, also potentially a patient of the cult syndrome disease. Section 3 is the bulk of the Hammacher’s paper, comprising 28 of the total 44 pages. In this Section of “Analysis of Behavior,” Hammacher presents eight characteristics of the syndrome of cultic behavior and supplies examples of behavior for each of the characteristic symptoms for each of the two targeted persons who are the subjects of the paper. This is Hammacher's strongest Section and to me Section 3 is the baby in the bathwater that should not be thrown out with the bathwater of the following sections. The 8 factors are important measuring sticks for evaluating the presence of organizational dysfunction, as well as interpersonal dysfunction on the individual level. Not just Zen groups, but every organization can benefit by a discussion of these 8 items and how they relate to the group's communication and interpersonal dynamics: a) Aggression upon being confronted; b) Extreme formalism; c) Blaming the student's ego; d) Hypocrisy; e) Groupthink; f) Information control; g) Self-aggrandisement or “cult of personality"; and h) Autocratic institutional control. It seems clearly evident that the behaviors listed for each of the 8 issues are fairly attributed. So I agree with Hammacher’s later observation in the Section 5 Summary “that cult dynamics might have played a significant role in both groups,” that is, the Zen Studies Society and the Mumon-Kai, however I would even go further and remove the polite use of the word “might.” I’m not an apologist for Eido Roshi. But “cult dynamics” alone does not make an organization a cult, because the specific symptoms of cult dynamics may be present in dysfunctional organizations that are not cults. In general, the idea that the structure and teachings of Zen Buddhism itself lie at the root of the problem, if true, would mean that every Zen sangha expresses the cultic syndrome. This is patently false. In a paper like this, if his criticism is not to be taken as a blanket criticism of Zen, it is incumbent on Hammacher to provide critical distinctions between the cultic groups he is targeting and the normative groups that he is not. It is extremely insufficient for him to try to cover over this crucial issue with a “Note Bene” of two sentences: “Though this paper is quite critical of two specific Zen teachers, it is not my intention to suggest that the reader should avoid Zen Buddhism at all costs. The practice of Zen meditation has in fact been very beneficial to me personally, and I leave it up to readers to judge its overall merits for themselves.” Here he merely mentions that his attack on two teachers of Zen Buddhism and their sanghas should not be taken as an attack on Zen meditation, yet his conclusions are specifically including Zen as an institution and therefore all Zen sanghas. Thus, this feeble attempt to protect “Zen meditation” as the baby in the bathwater fails, because as a practical matter there is no Zen meditation outside of the Zen sangha. If every Zen sangha is an institution at root that will grow into a cult, then Zen meditation itself must also share the same cultic root. Again, this is a false conclusion. The orientation of Hammacher’s premise is the same as the kind of critical studies that claims “religious wars are examples of what is wrong with religion.” However, that people fight wars in the name of religion has nothing to do with the cause of the wars or the legitimacy of the religion: wars have to do with the personal and archetypal orientations to and influences of power which can infiltrate any organization of humans. That the institution can be hijacked by people who are more concerned about social power relations than the practice of the religion does not make the religion illegitimate. Similarly, that the social dynamics of the two targeted Zen sanghas were hijacked as institutions and succumbed to the institutional illness of cult syndrome has absolutely nothing to say about the health of other sangha institutions of Zen Buddhism, and partly because there is no single homogenous institution of Zen Buddhism. Hammacher presumes that “The unspoken assumption in Zen has always been that the meditation alone naturally freed the accomplished practitioner from life's moral quandaries, without the need for rigid rules of conduct imposed from above.” Yet this is a false premise. The presumption shows a lack of understanding of Zen as a tradition. That people in the West may have come to Zen with wrong intentions and met with Zen teachers who mirrored those confusions is a psycho-social dynamic, not an institutional one. The cultic institution is built up within the influence of the psychological field to protect the structure of the power relationships, but the structure of the power relationships is not inherently Zen. In other words, Hammacher has completely missed the analysis of the cultic syndrome independent of the particular institution in which it arises. To the extent that the words or behavior of Eido Roshi and Dr. Zernickow are incongruent with Great Compassion, then they are deviating not only from Hakuin and Torei but also from the foundation of Zen Buddhism and Zen’s actually spoken assumptions. I don’t know anything about Dr. Zernickow other than what Hammacher presents, but based on the information that Hammacher provides, there is no basis to consider Zernickow to be a representative of Zen in the first place. In Section 4, Hammacher suggests six potential causes leading to the phenomenon of otherwise intelligent or reasonable Zen students accepting such flagrant misconduct: a) Lack of morality; b) Japanese authoritarianism; c) Impossible ideals; d) The Absolute vs. the Relative; e) The institution of dharma transmission; f) Emphasis on enlightenment; and g) Cultic tendencies. Hammacher discussion of these six points is conclusory and based on superficial presumptions and analysis. Hammacher posits that Zen has a “lack of morality” and that Zen “does not explicitly condemn any of the behaviour in question.” Of course, he says this in the context of having already presented Aitken Roshi’s explicit condemnation of the behavior in question as well as the condemnation of others’ involved in Zen. The confusion that Hammacher perpetrates and perpetuates here is the scholarly fiction that there is such a thing as “Zen” that exists independently of Zen practitioners. The illusion of Zen having or lacking morality is a convenient one for critics and supporters both, but it is people who have or lack morality, not Zen, and it is people who condemn or praise, not Zen. Even if it were to be said that we could know what “Zen” does or does not condemn by a survey of what a majority of Zennists condemn, Hammacher has not even pretended to determine what the majority or the mainstream of Zen practitioners or Zen teachers opine on the question. In effect, Hammacher doesn’t have a clue what Zen condemns or praises. Likewise, he doesn’t appear to have a clue what the view of morality is from a Zen perspective of no-perspective, which is certainly not a rationalization of immorality under the pretense of amorality. In Hakuin’s system of koan inquiry, the consideration of the Precepts as koans is the ultimate sequence of koans to be formally reviewed. As for the question of the causative effect of Japanese authoritarianism, Hammacher makes a good point about the necessity of differentiating a cultural attitude of authoritarianism with the practice of Zen, but he then again says that one will not find in Zen any condemnation of the negative cultural elements. And again, he asserts this while at the same time admitting that there is awareness of this issue among Zen teachers in the West. Determining this differentiation is among the most interesting issues of Zen’s transmission to the West. As for “impossible ideals,” it is the nature of all ideals to be “impossible.” There is an old saying that ideals are like the stars, we can guide our lives by them but don’t expect to reach them. The allegation that Zen practice “actually promotes some of the behaviour in question” is ludicrous. First, Hammacher alleges that Zen has the “utopian ideal of ‘egolessness’” which is in reality impossible to achieve. If “egolessness” is an ideal, then of course it is impossible to achieve, but is “egolessness” even a Zen ideal? I say no. Hammacher confuses the question of being aware of the role of ego in suffering with the question of what to do about it. I have never heard of a Zen teacher advocating “egolessness” in any way even remotely like a literal ideal. To see that the ego is an illusion is not at all the same as saying live life without an ego. Every living Zen teacher in the west that I have encountered either personally or by recording or book makes clear the distinction of seeing through the illusory and empty characteristics of the ego’s self-image and the realization of every day life as a human being. It is not just the Zen student who tends “to blame herself and her own practice for her less-than-perfect behaviour,” everyone does that. Such self-blame is an integral part of our suffering and is part of what spurs people to practice any religious or spiritual journey. .Again, Zen teachers all acknowledge the activity of self-blame and the various ways that we create infinite regressions of rationalization in trying to deal with it. No bona fide Zen teacher encourages students to achieve “perfect behavior.” Indeed, on the one hand Hammacher criticizes Zen for not demanding moral perfection and then on the other hand says Zen demands the perfection of egolessness. The grain of truth here is that an orientation to morals as rules does have a direct connection to self-image, and that seeing our true nature does mean inquiring into the literalization of morals and the self-aggrandizement with which we stick our thumb into the morality pie and pull out a plum and say “What a good boy am I!.” When Huineng said “Don’t think good or evil, at that time what is your original face?” he was not advocating anything to do with behavior or conduct that is amoral. He was teaching an advanced Zen practitioner about how to view. Huineng distinctly taught repentance as a prerequisite to Zen practice and stated that the two aspects of true repentance are the confession of past wrongdoings and the remorseful vow to not commit the same wrongs in the future. The teaching of “The Absolute and the Relative” is one of the most profound and difficult teachings of Zen. This scheme of the Absolute and the Relative is a sequence or series of five relationships between the absolute and the relative. The series is called the Five Ranks or Five Positions of the Absolute and Relative, Monarch and Minister, Real and the Apparent, etc. In the system of koan inquiry established by Hakuin, the Five Positions are the penultimate sequence of koans before the final sequence of considering the Precepts as koans. Unfortunately Hammacher portrays this deeply essential issue in the simplistic terms of an antagonistic dichotomy and labels it “The Absolute vs. the Relative”” as if the two were engaged in a lawsuit or divorce. So when Zen students, whether beginning or senior, espouse a “view of the ‘Absolute’ as different from the ‘Relative’” as Hammacher portrays, it is another example of a straw man argument presenting a misunderstanding as if it were the Zen view. Any attempt to manipulate “the relative,” i.e., dualistic view of opposites, on the basis of “the absolute”, i.e., the nondual view, is by definition a mistake of categories type of argument. If a Zen teacher tries to rationalize or justify his or her own bothersome behavior and conduct on the basis of “all imperfection is perfect” then either the Zen teacher’s words are misunderstood or the teacher is teaching error. Such teaching of error should not be confused, as Hammacher seems to do, with the teaching of the nondual Dharma of Zen. That is “responding to questions posed from the relative point of view of everyday life with answers coming from the Absolute perspective of Buddhism - and vice-versa.” is useful as a skillful means to demonstrate the limited understanding of the questioner. Whether it is in practice a useful and skillful means or simply self-serving manipulation depends on the context, i.e., the mind set, and the setting, of the exchange. Hammacher’s logical proposition--that from the “absolute” perspective there is no individuated self to feel suffering, therefore one can easily conclude that, ultimately, no abuse can ever occur—is based on a false premise that the absolute perspective destroys or eliminates the relative perspective. Instead, Zen teaches that the absolute perspective transforms the relative perspective, so that what was previously perceived as an opposition, i.e., Hammacher’s “vs.”, is seen with the wisdom of equality as unified in such a way that the multiplicity and differentiation of reality is perceived without the illusion of separation. Therefore, the person who has realized the transformations of the Absolute and the Relative and so manifests the Great Complete Mirror Wisdom and the Wisdom of Equality could not subscribe to the cockeyed claim that “no one betrays anyone” when the truth is that the betrayer, the betrayed and the betrayal are unified. That is, if anyone is betrayed then so too is Buddha betrayed. Anyone who uses the lame argument that there is nothing to judge or no one to judge in order to justify abusive behavior is by definition not presenting a Zen perspective. The institution of dharma transmission does present a difficult area for Western students to understand. In Western culture we have to look back to the master and apprentice or protégée models of education. The apprenticeship model of education does have its negative aspects, but in fact every system of education has its negative side. The apprentice has to earn the master’s approval and many guild masters did treat their apprentices as slaves and made them subject to abuse. There is nothing particularly unique or different from the apprentice model about the potential for abuse by Zen teachers and their students. However, the idea that the institution is abusive because of an inherent power differential is as silly as claiming that a Zen teacher as a perfected individual is the best friend of everyone that is met. If a Zen teacher holds himself or herself out as the sole means to salvation, then that person is to be avoided. It is just wrongly short sighted and one sided to hold that Dharma transmission is “actually a matter of institutional authority.” Saying so is to miss the picture as if a commentator on baseball were to say that pitching is “actually a matter of skeletal dynamics” and ignore all the rest of it. As for its aspect related to institutional authority, Dharma transmission confers teaching certification, nothing more. But that is not the only “matter” of Dharma transmission. However, no one should equate Dharma transmission with “nigh-divinity” and Zen teachers do not as a rule do so as Hammacher suggests they do. Even the most awakened Zen teacher, may not be the best or even a good teacher of Zen. The “Emphasis on enlightenment” is a causative factor in the student’s misunderstanding only to the degree that the student misinterprets “enlightenment” and holds it to be the teacher’s approval. Students who participate in a Zen interview (sanzen) with the Zen teacher with the expectation that the teacher can bestow enlightenment on them are students who have not been paying attention. However the teacher cannot just ignore these students and must find some way to respond appropriately. Generally, the responses are various ways of leading the student to independence from the teacher. The emphasis on enlightenment simply means keeping one’s eyes on the prize. Hammacher is incredulous that a Zen teacher may even be considered “as being both ‘enlightened’ and a sexual abuser at the same time.” This shows a fundamental misunderstanding of the term “enlightened” that seems to be shared by both Eido Roshi’s uncritical supporters and Hammacher. One of the essential teachings of Zen is that the meaning of words is not in the definitions. For example, the meaning of love is not in the multiple and varied definitions of love, but the multiplicity of definitions points to the fluidity of the meaning of love. Likewise, enlightenment is not one thing; it is not even a thing at all. It is indeed true that a person may enlightened to some regard, yet the person is still human and may behave badly, even delusory, or commit sexual abuse. This is a concept that some people find it impossible to understand because they do not see past the oppositional views. To see that an enlightened person can still fall into karmic entanglements does not mean the same thing as forgiving a shortcoming because it is “perfectly compatible per se with the goal of ‘fully awakened’ Zen practice.” The shortcoming is perfectly incompatible with awakened Zen practice and if forgiveness is appropriate, it is based on the incompatibility, not on an imagined compatibility. The enlightenment of Siddhartha Gautama is placed on the highest pedestal imaginable and indeed some people do see Shakyamuni Buddha with “nigh-divinity” or even greater than divinity, as he was called the Teacher of Humans and Devas (i.e., all heavenly beings including Gods). It is one of the greatest weaknesses of Hammacher’s paper that he advocates that the Zen community turn to sociology, psychology, or philosophy to learn something from Western methods, yet this paper is devoid of psychology. The analysis is purportedly sociological but is more akin to political. To understand how the emphasis on enlightenment Influences our working with a Zen teacher (or any spiritual teacher) we must open the inquiry into the psychological field that Freud called the transference and Jung preferred to call projection. We simply cannot adequately understand how an otherwise intelligent Zen student can lose their good sense without looking at the psychological dynamics of the teacher-student relationship in terms of the meaning of enlightenment as this is the most intense field of projection that a human can experience. The one diagnostic symptom mentioned by Hammacher that might suggest the targeted organizations are cults is the issue of “excessive mind-altering practices.” However, this highly subjective issue is not per se determinative of a cult. All spiritual practices are mind-altering practices; otherwise they could not be called spiritual practices. The question revolves on the meaning of “excessive” and on the valance of voluntariness of the context in which the excessiveness is encountered. Attending a sesshin with so-called excessive practices is entirely voluntary. There is no entrapment involved. The sole enforcement mechanism is peer pressure. By this definition, the excessive behaviors enforced by peer pressure in high school would make all high schools snake pits of teenager cults. Before concluding that a Zen practice center is a cult, it is necessary that a thorough analysis of the mind-altering practices be made in terms of their efficacy and risk-benefit. Olympic athletes typically subject themselves to excessive training practices. Does this make the Olympics a cult? Another factor is whether the people who left required deprogramming upon leaving in order to better adjust to society free of the cult. Since there is no uniform post-cult trauma, this is not a determinative factor by itself, but it is one of the symptoms that appears to be missing at least with ZSS. Also, with any reports by persons who have left an organization the reporter’s role as either an apostate or leave taker must be determined in order to have a clear perspective on the report. Apostates typically have an apostate narrative in which they use a “captivity story” that emphasizes their entrapment, manipulation, and victimization. Apostates typically discredit the stories of voluntary leave takers who do not employ a victim narrative and who take responsibility for their leave-taking sometimes without condemning the organization other than saying it was not what they were looking for. Hammacher has not only failed to adequately clarify the distinction between cults and founder’s syndrome, but he has failed to adequately identify the inner dynamics of cults themselves and to employ even a modicum of critical analysis as to the informants he relies upon and failing to distinguish between apostates and leave takers..
Hammacher’s conclusion that “if only some of the many allegations against Shimano and Zernickow are true, there still can be no significant differentiation between such “dharma-transmitted” Zen Buddhist masters and other, more run-of the-mill gurus and cult leaders.” does not stand up to scrutiny. There are very significant factors of differentiation between the usual lineup of cult leaders like Jim Jones, Sun Myung Moon, L. Ron Hubbard, and David Koresh, just to name a few, and a Zen teacher like Eido Roshi. If Hammacher sees “no significant differentiation” then he is just blind, and this kind of hyperbole undermines his credibility. While Hammacher has identified cult-like aspects and tendencies in the targeted organizations, he has failed to demonstrate that they are cults and not just organizations suffering with founder’s syndrome or some closely related disorder. By relying on his inadequate analysis and misleading discussion of cults, Hammacher’s allegations against Zen Buddhism “as an institution” fail. Certainly we can agree or disagree on a case by case basis whether there is or is not organizational dysfunction, but there is no basis to agree that the vast majority of Zen sanghas are exhibiting cultic tendencies. The acculturation of Zen in the process of transplantation to the West will continue to occur over the next couple of hundred years. Organization experimentation is ongoing and will continue. Take care and cherish it. I am sorry to say that you are acting like an apologist in your criticism of Christopher Hammacher’s (granted, horribly titled) report. Hammacher, himself a long time practitioner, provides pages of first hand reports from two groups that have gone off the rails into sometime psychological and physical violence, sexual violence, mind control, information control, isolation of dissident members, and (in one of the two cases) abuse by the group leader of his role as a medical doctor and therapist. You discount this as a touch of "founder's syndrome"? You think that the author is wrong in pointing to certain characteristics of Zen Practice and Doctrine ... the position of the "Enlightened Roshi", the amorality that (naively) can be claimed in the Absolute, the violence and psychological pressure often found in Zen training especially in Japan ... as IN THE WRONG HANDS conducive to cultish and abusive behavior? The result, Greg, is that you are white washing these legitimate criticisms. I am going to have to write something longer on this. I think I will call it "Zen Has Morals ... and apologists too". I don’t deny being an apologist for Zen, but there is no apology for Shimano Roshi contained in my comments. Any perceived apology is merely a projection based on the prejudice against Shimano Roshi. It is pretty simply the case that from the perspective of someone who has taken sides, anyone who stands in the middle is going to be perceived as an apologist for the other side. The Section 3 collection of anecdotal reports has credibility, but of course they are not neutral reports. What does that mean? It means that I refuse to be ignore the fact that reports such as these have context. I refuse to jettison my own sensibilities and abilities of analysis and abdicate all evaluation in order to join the indiscriminate attack. My attack will remain discriminating, thank you. You apparently are discounting “founder’s syndrome” by using the word “touch.” To the people who are abused there is no emotional differential between abuse by the founder and abuse by a “cult leader.” However, to society there is a great importance in the correctness of the diagnosis. As for the so-called medical doctor and therapist, he seems to be engaged in malpractice and I’m quite surprised that he had not been sued and had his license removed assuming the stories are true. Something is going on there that has not been revealed by Hammacher’s report. Second, the so-called position of the "Enlightened Roshi" is an aberration, but is it a Zen issue or a relationship issue? For example, a physician becomes “a God” and many are the nurses who complain about the medical god complex. Too many are the doctors who take advantage of the people around them even patients. Does that make the medical institution suspect? The real question has to do with power-relationships between people in all contexts, which in my POV is primarily a psychological issue. All peoples project their feelings of insecurity onto the people with religious authority, whether they are Roshis, Imams, Rabbis, Priests, Ministers, Gurus, Shamans, etc. This has nothing specifically to do with Zen as an institution. Adept teachers know how to deal with these projections, while the inept fail at dealing with these projections and become caricatures of themselves. Zhaozhou asked Touzi, "So, what about the time that the fundamental person of the great death returns to life?" Touzi said, "It is not permitted to go traveling by night; one must be thrown into the brightness to arrive." Lastly, there is not one thing in this entire universe that can not be used abusively in the wrong hands. But the question that is important is to what degree, and in what way, are the abuses of wrong hands to be attributed to the instrument that is being abused? Is a hammer institutionally corrupt because its head is hard and its claw is sharp when it is used in the wrong hands to kill someone? If we take that approach and criticize the institution of the hammer and say the head must be softened and the claw dulled, then at what point does it cease to be a useful hammer?